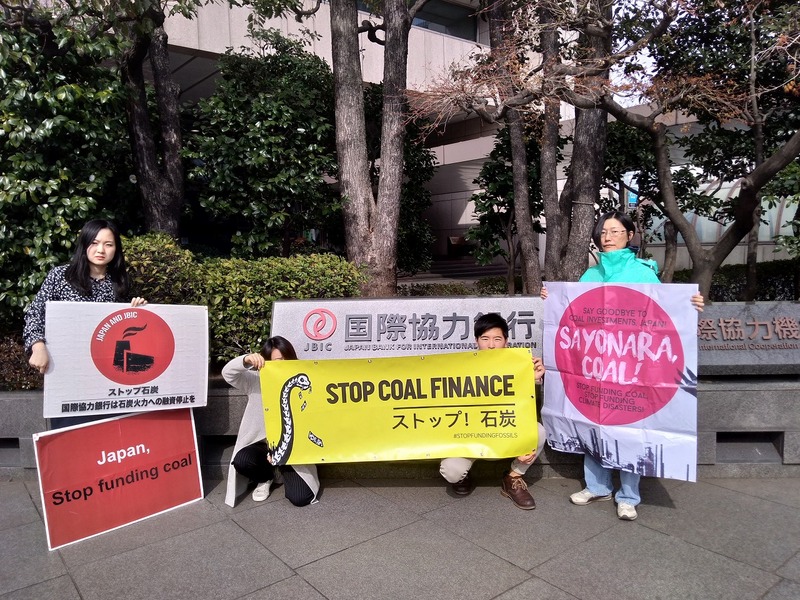 Today, Friends of the Earth Japan submitted our urgent request letter to the Japan International Cooperation (JBIC) to demand them not to finance a coal-fired power plant project in Van Phong, Vietnam. This letter was signed by 25 organizations in 50 different countries. This project plans to construct two supercritical coal-fired power plants (660MW each) in Ninh Phước Commune, Ninh Hòa Township, Khánh Hòa Province in Vietnam. The main sponsor of the project is Sumitomo Corporation, and now JBIC and the Nippon Export and investment Insurance (NEXI) are considering of financing it. It is reported that the Japanese three mega banks, namely Sumitomo Mitsui Financial Group (SMFG), Mitsubishi UFJ Financial Group (MUFG) and Mizuho Financial Group may also finance the project. Towards this project, a number of environmental NGOs, both national and international, have been voicing their concerns, and there was even an advertisement in today's Financial Times Asia. According to the OCED Sector Understanding on Export Credits for Coal-fired Electricity Generation, to which Japan is a party, export credit finance can only be provided to projects with either 1) ultrasupercritical technology, or 2) an emission intensity lower than 750g CO2/kWh, when projects are larger than 500MW. Since neither applies to this project, JBIC and NEXI must not support it. No More Finance to Coal Fired Power Plants! 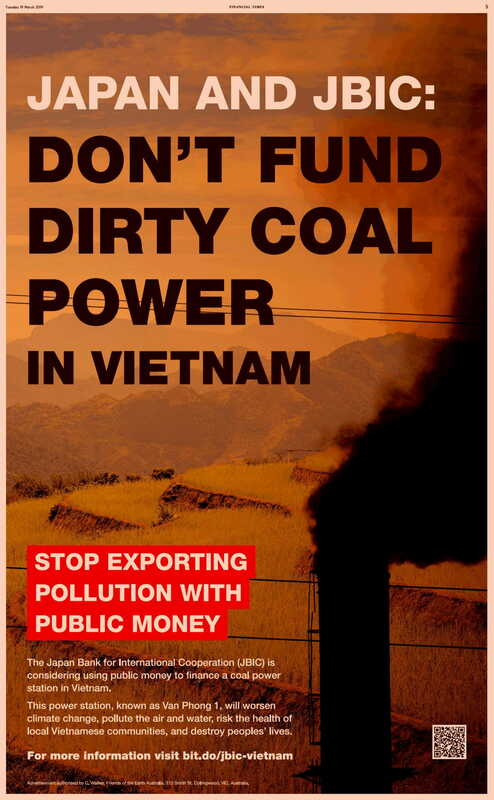 We, the undersigned organisations, demand the Japan Bank for International Cooperation (hereby JBIC) not to finance Van Phong 1 coal fired power plants in Vietnam. Van Phong 1 is an inefficient and polluting coal fired power station. The technologies used to control air pollutants are not Best Available Technology (BAT) and it worsens Vietnam’s air quality and damages the health condition of residents. There is no room for new coal power plants if we want to achieve Paris Agreement goals, and therefore financing Van Phong 1 contradicts Japan’s commitment to climate change. Under the OECD Sector Understanding on Export Credits for Coal-Fired Electricity Generation (OECD Sector Understanding), to which Japan is a party, export credit finance can only be provided to projects larger than 500MW that either 1) use ultrasupercritical (USC) technology, or 2) have an emission intensity lower than 750g CO2/kWh. As neither criteria applies to Van Phong 1, JBIC must not support this project. JBIC explains that since the first Environmental and Social Impact Assessment (ESIA) of the project was completed and approved in 2011, the project is exempted from the OECD sector understanding . Although the initial ESIA was completed in 2011 and revised in 2015, the most recent ESIA was completed in November 2017. As Van Phong 1 has a new, further developed ESIA that supersedes the previous documents, it does not fall into this exception. Van Phong 1 would also produce significant air pollution according to its ESIA. It has determined that the Van Phong 1 would produce certain air pollutants at rates significantly higher than the average new coal fired power stations in other countries. In terms of SO2, Van Phong 1 will produce at least 3 times as much as new stations in Japan, and for NOx it would be about 5 times as much. Dumping polluting technology on Vietnam is unacceptable and creates significant legal and reputational risk for the bank. In addition, mercury is not well considered in the ESIA. According to JBIC, the mercury emission is below detection limit and thus in the ESIA the emission of mercury is shown as “0”. However this could hardly be true. Based on the UNEP Mercury toolkit, which is one of the methods Minamata Convention recommends, if the power plant burns typical Indonesian and Australian coal with the specified emission control devices, it would emit around 50kg of mercury per year. Even if the mercury emissions were controlled using BAT, mercury emissions are a significant environmental impact that should be declared and assessed in the ESIA. Communities in the area should be made aware of the risks this mercury could pose to their health, so even if mercury emissions are calculated, further public consultation and stakeholder engagement must be conducted. The JBIC Guidelines stipulate that JBIC may deny financing for a project where a project proponent fails to undertake appropriate environmental and social considerations. The guidelines state, “JBIC also refers to standards established by other international financial institutions, other internationally recognized standards, and/or standards or good practices established by developed countries such as Japan as benchmarks”. This project clearly violates this. The Japanese government is openly seeking to limit global warming. Prime Minister Abe has publicly committed to halting runaway climate change, which he linked to the unprecedented devastation in 2018 from torrential rain in western Japan, heatwaves in North America and Europe, and typhoons in the Philippines. Financing for this project would undermine the Japanese government’s policy to abide by the Paris Agreement and take steps to limit warming to 1.5 degrees Celsius. It would also undermine Prime Minister Shinzo Abe’s calls for climate leadership at the upcoming G20 meetings. In addition, there are other social and environmental concerns associated with Van Phong 1. The ESIA of the project had not been disclosed to the local people appropriately. While it is a large scale project posing significant adverse effects, not enough information are provided to the relevant stakeholders. In fact, there are communities in the area that have expressed concern to Vietnamese civil society organisations about the effect of the coal ash and the impact of discharge of cooling water on the fish in the bay. The Vietnamese civil society organisations report that while the communities on the site of coal fired power station have been resettled, there has been little thought about alternative livelihoods for farmers and nearshore fisherfolk. Due to all the reasons above, we urge JBIC to stop further consideration of Van Phong 1, and not to support any new coal power projects.